100 interlocking easy stacking chips. 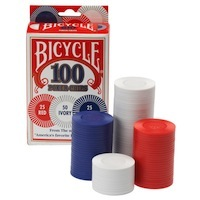 Includes 50 Ivory, 25 Red, and 25 Blue Chips. Durable washable plastic. Dimensions: 3" x 5 1/8" x 1 5/8"